Guy Pegler was born on 27 September 1921 in Ringwood, Hampshire, the older of the two sons of Claud and Charlotte Pegler. The family would later move to Letchworth in Hertfordshire, where he went to Letchworth Grammar School. 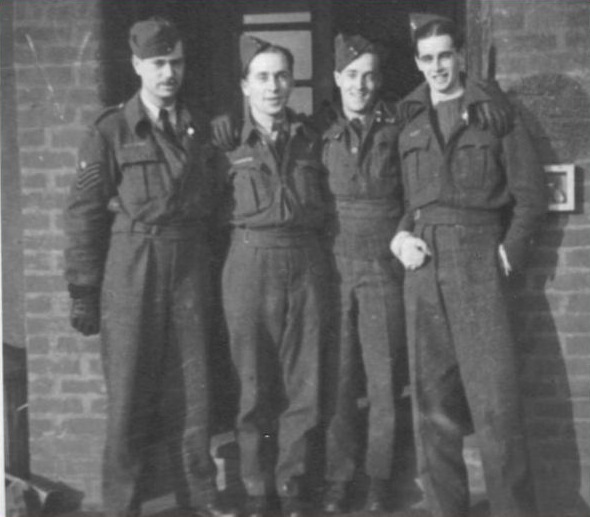 Pegler was known by the nickname “Johnny” during his time in the RAF, which he joined in 1938 as an apprentice at No 1 Training School, RAF Halton. He served in ground crew in the early part of the war, mainly servicing aircraft in Fighter Command, before taking the opportunity in 1942 to train as a flight engineer in Bomber Command. After qualifying, he was posted to 106 Squadron’s Conversion Flight where he joined up with Lewis Burpee and gunner Gordon Brady for the final stages of Lancaster training. The trio were posted to 106 Squadron in October 1942. On 24 October 1942, the day Burpee flew on his final operation as second pilot (with David Shannon), Pegler had the dubious privilege of making his operational debut, accompanying the Squadron CO, Wg Cdr Guy Gibson on a trip to Milan. At that stage in his career, Gibson had a different flight engineer or second pilot on nearly every one of his operations. Whether they volunteered or instead were chosen by him is not recorded. Pegler survived the experience, and was able to rejoin Burpee and his crew for their first trip together as a crew, on a “Gardening” operation to the Silverthorn area on 16 November 1942. Thereafter, Pegler flew with Burpee on all his 25 operations in 106 Squadron and went with him to 617 Squadron. On the Dams Raid, he would have been in his usual seat, alongside his skipper, as they flew too close to the heavily defended Gilze-Rijen airfield and crashed in a ball of flame. The Germans could not individually identify the bodies of Guy Pegler, Bill Long, Tom Jaye and James Arthur, so they were buried in a communal grave in Zuylen Cemetery, Prinsenhage. After the war the bodies of all seven of the crew of AJ-S were exhumed and reburied in Bergen-op-Zoom War Cemetery.